"While you're at home resting, someone else out there is working hard." - Gilbert Arenas, Sr.
What is a Counseling Psychologist? What is a Sport Psychologist? Thank you again EdLink Foundation for the opportunity to talk to your teachers. I enjoyed your stories and hope that you were able to take something away that will help your students. Last April 10, 2017, I had the opportunity to talk to several of the EdLink Foundation teachers on the subject of bullying. Bullying prevention was the subject of my Masteral thesis in graduate school and has been an advocacy since then. If you would like me to talk to your school administration, teachers, counselors, students, and their parents about bullying strategies–you can reach me over at my Facebook page. In order to raise awareness on the subject of bullying, Everest Academy Manila has invited me to talk on “The Psychology of Bullying among Children and Adolescents” (2:45 PM to 3:30 PM) during their upcoming Bullying Prevention Mini-Conference. Teachers, parents, and other members of the Everest Academy Manila community will be on hand for this and other scheduled mini-conference talks. It will be held at the Everest Academy Manila campus at 38th North Drive, Bonifacio Global City, Taguig City on September 24, 2014. 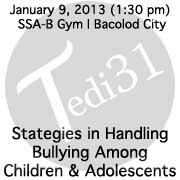 I’ll be flying to Bacolod City tomorrow for a talk entitled, “Strategies in Handling Bullying Among Children & Adolescents.” The event is a part of St. Scholastica’s Academy – Bacolod City (SSA-B) 2013 Institutional Parents’ Enrichment Talk and is open to all SSA-B grade school and high school students/faculty/parents. The talk will run from 1:30 PM to 3:30 PM at the SSA-B Gym, St. Scholastica’s Academy in Bacolod City. Special thanks to Mr. Bryan A. Villasor and SSA-B for making this event possible. Kindly click here for the handouts. Subbed as a guest professor today in Dr. Ma. Teresa Gustilo-Villasor’s The Center for Family Ministries (CEFAM) class on Counseling Children and Adolescents while she is out of town. The class was held on January 8, 2013 at 2-4:30 PM in the Ground Floor Seminar Room, Spiritual-Pastoral Center, Ateneo de Manila University Campus, Loyola Heights, Quezon City. Click here for the handouts. 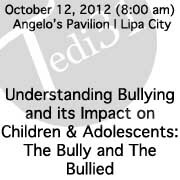 As part of their Mental Health Week Celebration and World Mental Health Day, the Philippine Mental Health Association Lipa-Batangas Chapter (PMHA) has invited me to give a seminar on the topic “Understanding Bullying and Its Impact on Children & Adolescents: The Bully and The Bullied” on October 12, 2012 from 8:00 AM to 12:00 NN at the Angelo’s Pavilion, Blue Sapphire, Barangay Sico, in Lipa City. I look forward to meeting you all next month! Just got word that I’ll be the last speaker for the program (11 AM to 12 NN). 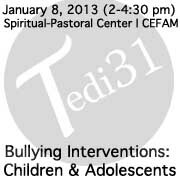 On February 16, 2012, the Claret School of Quezon City will be inviting me to speak to several of their Grade 5 sections on the subject of bullying and bullying interventions. 10/18/2011 tedi31	Enter your password to view comments. Exhibitor during the Komiks at Kultura Exhibition to be held in the Lobby of Ayala Museum, Makati City on January 26, 2019.